- 4 foundation piles (top right) - build up regardless of suit, wrapping from King to Ace as necessary, until each pile contains 26 cards. At the start of the game a card is dealt to each pile. - 4 cells (top left) - storage locations for cards. Only 1 card allowed in each cell. The card is available for play on the foundations only. - 10 tableau piles (below foundations and cells) - No building is allowed. 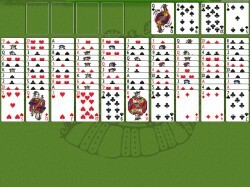 The top card is available for play on the foundations or cells. Only one card at a time may be moved. Spaces are not filled. At the start of the game 10 cards are dealt to each pile. - 4 foundation piles (top right) - build up regardless of suit, wrapping from King to Ace as necessary, until each pile contains 13 cards. At the start of the game a card is dealt to each pile. - 2 cells (top left) - storage locations for cards. Only 1 card allowed in each cell. The card is available for play on the foundations only. - 8 tableau piles (below foundations and cells) - No building is allowed. The top card is available for play on the foundations or cells. Only one card at a time may be moved. Spaces are not filled. At the start of the game 6 cards are dealt to each pile.